Showing results for tags 'world cup'. Le soccer canadien en français! What is the only country in the world to have hosted ever FIFA event in both the men's and women's game? It's just a trivia question, but one that the Canadian Soccer Association badly wants to be the answer to. As of right now that answer is no one. If the United Bid of 2026 wins the day, Canada will lay claim to winning a race that no one else realized they were running (if we conveniently consider the 2002 Women's u19 event the current FIFA Women's U17 World Cup that is, but let's not get bogged down in literal facts right now). The idea that this frozen land of ice hockey loving hosers that call the game soccer could possibly be the first to host every potential event is a compelling one and one that will get trotted out a lot in the build up to the bid vote and (hopefully for the CSA) over the eight year preparation for hosting. The dream of landing the big prize of the men's World Cup has been openly talked about in Canadian soccer circles for at least a decade and work on a bid has been ongoing for far longer than most people realize. However, it was only in recent years that the CSA was convinced to drop their solo bid and instead attach their hopes to the United States where they are very much a minor partner along with Mexico. It was really a path of least resistance for Canada. The US obviously has some incredible infrastructure advantages that neither Canada or Mexico can match, without building new stadiums themselves. Although Canada could build the stadiums -- We're rich. We could -- in today's political climate getting stadiums built with public funds is an exceptionally difficult thing to do. But, also in today's political climate the United States has elected a man who is...let's call him divisive. That shouldn't offend any of his supporters that might read this, as they value that divisiveness. That's their choice, but what matters here is that those who did not chose, or have a choice, to elect Donald Trump President do have a vote in the election to chose the 2026 World Cup host. And, many of those people do not appreciate Trump calling their country a shithole, as he was perceived to have done last month. There's no sense being coy about this. Trump is an obstacle to the bid winning. 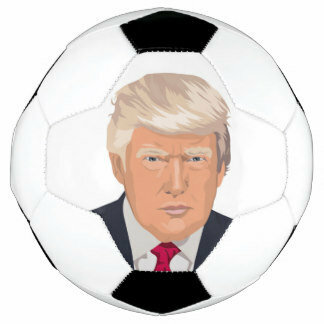 Canadian soccer has attached itself to the Trump Train, whether it wanted to or not. And the train could throw the bid straight off the tracks. When Morocco launched its bid to upset the United 2026 bid few gave it any chance. Now, however, many people are starting to do the math and are getting very nervous. As much as the ExCo voting structure was a mess that gave us Qatar and Russia, it was a little more predictable. The new one country, one vote system is a bit of a mystery. That said, some math: United Bid -- Nearly sure thing: CONCACAF 38 (Canada, USA, Mexico and Nicaragua) not eligible) votes, Western Europe 31, Oceania 14 + Japan and Australia = 84 votes Morocco -- Nearly sure thing: Africa 55 votes (Morocco not eligible), Middle East 12, Central Asia 6 votes + North Korea = 74 votes That leaves the rest of Asia (26 votes), South America (10 votes) and Eastern Europe (24 votes) as your decider. Can the United Bid find 20 votes from that 60? Probably? Probably isn't that reassuring, especially since much of Canada's rebuilding plan on the men's side is dependent on getting this bid. And it's increasing becoming harder to argue that a Canada only bid would have been any worse off than tying ourselves to the political anchor that is the current state of US politics. I’ve often told the story about how the first soccer game I remember watching in its entirety was the high water mark of the Canadian men’s national team – the infamous day in St. John’s when a bunch of hosers qualified for the World Cup for the first and only time. I’m the anti-Drake. I started from the top and now I’m here. However, that’s not the first soccer memories I have. Growing up in a family with British heritage (my grandmother was born in Bristol, England, and I have family in the UK to this day), I was exposed to all sorts of English culture from a young age. I eat beans on toast, watch Doctor Who (although I picked that habit up as an adult – On The Buses and Are You Being Served? were more of my childhood staples) and, most relevant to here, have always had an affinity to sports played in the UK. Had soccer been on television more often in the early 80s, I’m sure my young self would have watched it. I know that I was aware of it though and I spent a great deal of time learning about British sporting heroes. I was likely the only person in my elementary school who knew who Sebastian Coe was. I also knew who Wayne Gretzky was, obviously, because try as I might my English heritage was never going to overshadow my Canadian upbringing. Thus, when I stumbled upon that game in St. John’s oh so many years ago it was like a light-bulb went off in my head. Finally I had found something that was totally and completely mine – something that combined all aspects of my evolving self-identity into a single thing that was new and exciting and that spoke to a Canadian experience that seemed modern and different from the experience that my parents had had growing up. Although at the time I probably just thought it was cool. I wasn’t that deep as a kid. At any rate, these thoughts came back to me today upon reflecting on an anniversary of significance for Italians and for the city that I now call home. It was 35 years ago today that Italy won the 1982 World Cup. At the time this had limited impact on my life. As I said, I was aware of soccer, but watching the World Cup final was not something I would have considered important at that time (maybe if England was playing, but they weren’t and Italy had no personal connection to me in any way). But, what I do remember was being at my Aunt’s house the next day when the Toronto Star came to the door. Upon looking at the front page, which featured 500,000 people celebrating the win on St. Clair West, Auntie Mona let out an audible gasp – paraphrasing, she said something along the lines of “I can’t believe there are that many people here that care.” I’m sure a lot of people in Toronto said the same thing that day. It was the last time they said it though because that was the day that would forever betray the idea that soccer wasn’t important to a great deal of Canadians. It was the day that Pierre Trudeau’s image of a multicultural Canada that blended traditions and passions of both here and there into one unique Canadian experience became real. Moving away from the sociopolitical, it was also a day that changed the sport in this country. If you look back on the soccer participation boom of the 1980s, it likely started with that image of 500,000 people that cared. That was also the day that other cultures started to slowly tear away from the British dominance in managing the game. Soccer had always been here, but it started its march to the mainstream that day. 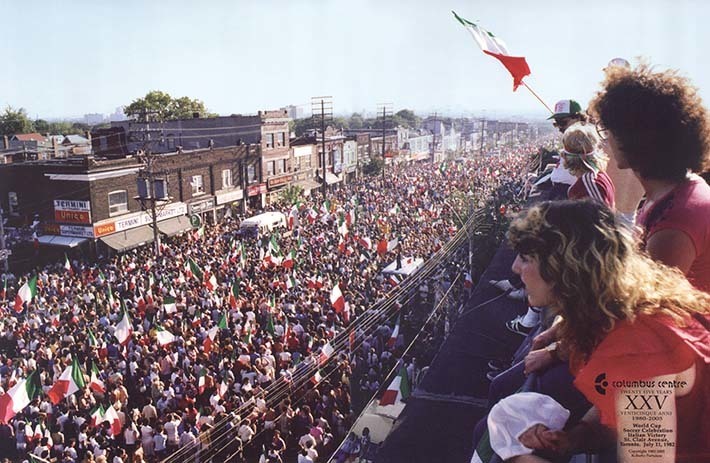 There were also a lot of young kids of Italian decent that watched that game that day and then traveled down to St. Clair West to celebrate that ended up getting deeply involved in the game. But, they did so with the same (if slightly more Mediterranean) outlook as I had. They were of Italian decent, but they were also Canadian. They too brought a blended experience to their soccer passion. It didn’t happen overnight, but eventually that lead to a soccer culture that is thriving now – a culture that instinctively understands that it’s possible to have duel (or more loyalties) and that there is something in the sport for everyone. Obviously, the national team success is a different story (but not if you extend it to the women, where the North American mindset towards equality has allowed the New Country to surpass the Old when it comes to the women’s game – I guarantee there were people in that attached photo that also were also smiling in 2012 and 2016 when Canada claimed bronze), but on a participation level and a spectator level there absolutely has evolved a uniquely Canadian perspective on the Beautiful Game. A perspective shaped by Italy in 1982 and 2006 and Canada in 2012 and 2016 and by the arrival of a new domestic club culture starting in 2007 (and by hundreds of other moments from both here in Canada and around the world). It doesn’t have the same length of history as you’ll find in other parts of the world, but the history it does have is every bit as real and reaffirming. And it all started when 500,000 Canadians of Italian decent took to the streets and told us soccer matters. "We're at approximately 15 [thousand] right now," Montagliani said of tickets sales for the Honduras match. "We've got two weeks left pretty much. We have a big Whitecaps game obviously inbetween. We're confident with the build up. "The team will be here pretty soon, this weekend. A lot of them will be at the Whitecaps game. So I think we'll be able to sort of push into the 20's." So the numbers are promising but at the same time a little disappointing. When the match announcement was made in Vancouver on September 14th, the general feeling from the Canadian Soccer Association side was that the game wasn't going to be a tough sell and if Vancouver struggled to fill the lower bowl at BC Place then it couldn't really call itself a "soccer city". I tended to agree. It is the national team after all and it's a World Cup qualifier. With eight days before the game, expectations have been adjusted a little. "A lower bowl sell out was always our goal," Montagliani admits. "But if we get north of 21, between 21 and 26, that's good. If you look in comparison at the same round last time around, we played them all in Toronto and the highest attendance was 18. That's 2012 when we played Honduras again, and Panama and Cuba. "So our goal was to surpass what we did in Toronto back in the last round of round four. We're confident that we can surpass that and if we can get as close as we can to a lower bowl sell out, that will be great." Looking back to that miserable failed campaign for Brazil 2014, the attendances in Toronto for the three, then third round, matches were pretty steady. Canada drew 16,132 for the 0-0 draw with Honduras in June 2012 and 17,586 for the 1-0 win over Panama in September, before topping out with 17,712 for the 3-0 win over Cuba in October. If the CSA are targeting beating those attendance figures this time around, then they certainly seem well on their way in Vancouver to kick things off. But were the attendances in 2012 relatively poor and disappointing? You can argue both ways but personally I believe a national team in a football loving country should sell out a stadium the side of BMO Field in Toronto for all World Cup qualifiers. Maybe I live in a fantasy world where football is king, but I truly believe this should be the realistic expectation. Which brings us back around to whether Canada cares about it's national men's soccer team. We're always saying here at AFTN that Canada is a footballing nation. But is it? Montagliani firmly believes it is and feels the crowds the national team draws and the interest in the team is more than comparable with elsewhere in the world. "It's funny. because I know our results have always been mediocre at best," Montagliani honestly admitted. "But we're always so hard on ourselves that we're not a soccer country. But if you actually compare us to most countries in the world, we actually are a soccer country because a lot of professional leagues in the world do not get this kind of attendance. A lot of national teams don't get this kind of attendance. "So yeah, if you're comparing it to the big five in the world, of course, but I don't think that's a fair comparison. But I think if you look at it from a global perspective, Canada is a soccer country and I think the numbers and the proliferation of the game over the last ten years I'd say, or more, has shown that." The biggest factor in increasing support, interest and awareness in the Canadian national team is success on the pitch. That's the hard part, but the signs are there that this current squad of talent Canadians has the ability to go far. 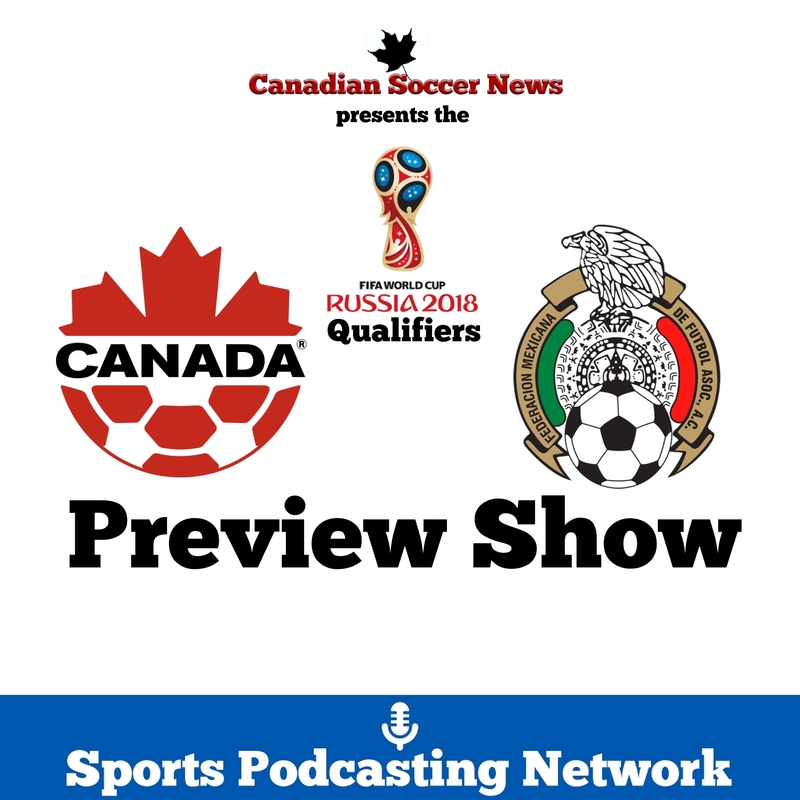 On the pitch success aside, to grow the game, you also need to promote the game and frankly the promotion of the Canada v Honduras match in Vancouver has been dreadful. I've seen online ads, but little else. Online ads targeting the likes of me do nothing. We're already the ones that know about the game. Promotion elsewhere has been lacking, making the 15,000 ticket sales all the more impressive. How many of the Whitecaps crowd know, or care, that the game is on? How many of the general football loving fans in the city and the province? Montagliani admits that the initial promotion has been slow, and perhaps a little understated, but with just over a week to go he fully expects the CSA promotional machine to go into overdrive. "I heard a little bit about that," Montagliani told us when we asked about the criticism around the lack of promotion for the match. "I think you're going to see a lot of that ramped up. We have to be cognisant too that there's another big game in town too and we're working together with the club [Whitecaps]. They've been excellent with us. "I think you're going to see a lot of this ramp up over the next two weeks. What we have found too, and I think a lot of professional sports [have], is that if you do your advertising too far in advance, it gets lost. It gets lost with too many other things. "You want to hit it hard and often, as close as you get to the event. In fact I know a lot of sponsors are like that. A lot of sponsors like to get in at the right time because there's too much of a lag and they don't see a build up. I think you're going to see a bit of a build up over the next two weeks, I guess, leading up to the game." Slightly worrying that the President thinks that there is still two weeks left to promote the game. There's eight days. But Vancouver is, annoyingly, known as a walk up market, so I do expect a late flurry of sales once the promotion is increased. If the final crowd next Friday isn't over 20,000 it would be a major disappointment. But as Montagliani said, there's another big game in town before then. The Whitecaps have now sold out the full lower bowl for their MLS Western Conference semi-final second leg against Portland. That's 27,500 fans. Will they be targeted to head back to the stadium five days later to watch Canada? Hopefully yes. There's a big buzz in the city right now around the Whitecaps and football, and that can surely only get people to the Canada v Honduras game. Right? "Listen, at the end of the day, the Whitecaps have to win," Montagliani said. "Not if, they have to! Would it help us? Absolutely it would help us, but I think it's more I look at it in a bit of isolation. You want our club, our home team to do well. Nothing would make me happier to see a Montreal - Vancouver final." You can almost here the alarm in MLS headquarters at such a prospect! But back to the World Cup qualifiers. Canada have six matches ahead of them in this round before the Hex. It's the semi-final stage in the CONCACAF qualifying and every point is crucial. Any advantage Canada can give themselves, they have to take it. Which brings us back to Vancouver. That turf pitch could be a big advantage. Canada's two remaining home games at this stage are against Mexico on March 25th and El Salvador on September 6th. Could we see either of those matches in Vancouver as well or has it already been decided that Toronto will get their team back? Montagliani said there's been no decision made as of yet. "That won't happen until after we have this home and away here," Montagliani told us. "We'll sit down in December, January, then we'll decide, probably before the end of January, where the March 25th Mexico game is." It's been 11 years since the national team played in Vancouver. Will it be another 11? Unlikely, but how much does bringing Canada back to BC Place depend on ticket sales for this Honduras match? Not at all, according to Montagliani. "We've never seen it as a referendum," Montagliani added. "We've always seen it as British Columbia and Vancouver has always been a hotbed for soccer. I'm from here, so I know that intimately. It was just the right decision to make. Not only for the team, but for a lot of reasons. Technical, tactical reasons. "Listen, at the end of the day, it's about three points. Do want a full stadium? Absolutely. Do we want the fans to go home happy? Absolutely. Our primary goal is three points." One thing has at least been finalised and that is the TV deal for the national team. After bouncing around Telelatino, online streams and legendary Mad Dog and Maestro commentaries, Canada's national team has a new home for now - TSN. At least for the home qualifiers. Who knows the fun we'll have in store for the away ones! "TSN is our TV provider for this round," Montagliani confirmed. "All three [home] Canada games, between now and next September, will be shown on TSN. Going forward, it's a one year deal because we don't know what's going to happen after this round. I'm not at liberty to say what the actual contract is but obviously there's options there. "In terms of away games, it's a little bit more complicated because we have to negotiate those rights away from those countries. So we're in the middle of doing that and hopefully we'll be showing all the away games as well. It's not as easy to say you can shoe them all. You can't go and plant your cameras in somebody's stadium without their permission." But forget TSN next Friday. If you're free and in the Vancouver area and you're not heading along to BC Place to cheer on your national team, shame on you! If we want to see Canada back in our city, we need to "Pack The Bowl" and show the CSA that Vancouver really is Canada's "soccer city". 'Found In The Attic' is AFTN's look at some of the wonderful pieces of Whitecaps, Canadian and North American footballing memorabilia and collectibles from both yesteryear and more recent times. We continue the series with a look at some Canadian national team memorabilia. With World Cup qualification hopes on the line tomorrow in Honduras, it seemed a very fitting time to dig this one out. As each World Cup cycle comes around, it’s always hard not to think back to the one time that Canada did qualify. 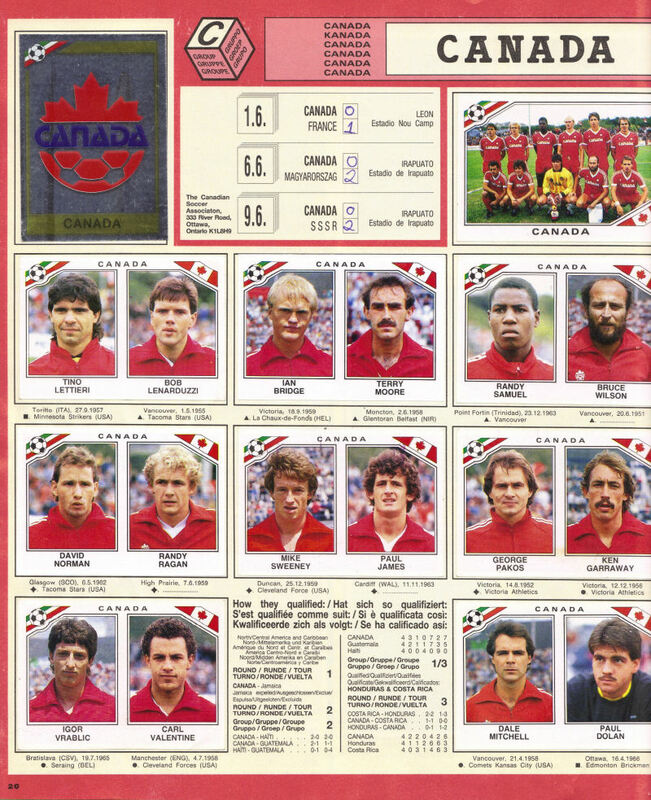 Mexico 86 will long live in the memories of Canadian football fans and for those of us who still have the Panini sticker album from the tournament, it will live on even longer. There was lots of memorabilia produced for the World Cup that year, as every year, but for me, you can’t get much better than a Panini sticker album. 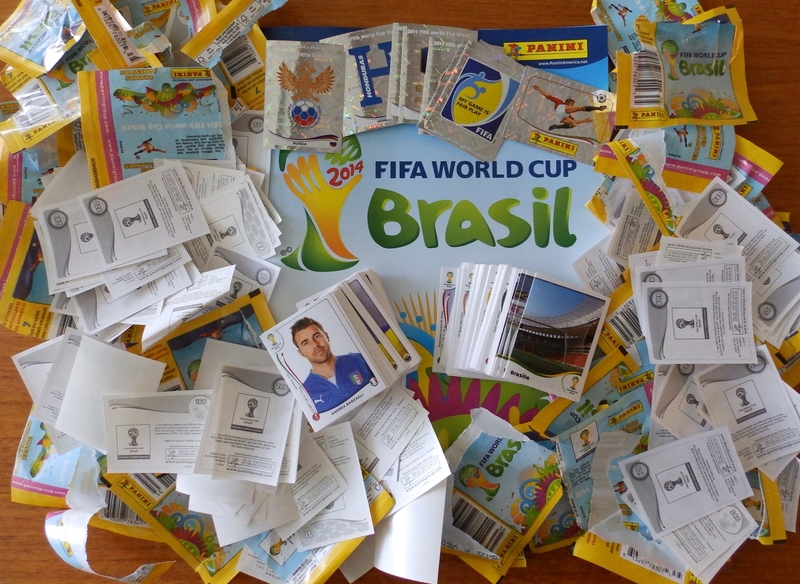 Long time readers of AFTN will already know our love for Panini sticker albums. The Mexico 86 one has always been one of my favourites, partly due to the fact that it’s the oldest one I still have that was originally mine. I bought an Espana 82 one off ebay, but it doesn't have the same sentimental attachment when it’s not yours. Add in the fact that it’s the only one that features both Scotland and Canada and now it’s even more special! Remember when we both qualified for World Cups? Sadly a whole generation on both sides of the Atlantic doesn’t, but we always have our Panini memories. The 52 page album featured 427 stickers in all, featuring World Cup posters of years gone by, host cities, stadia and, of course, the teams and players. It cost 20p in the UK, 49c in Canada and 35c in the US. Sadly my sparsely completed album will cost an arm and a leg to try and complete now, but I do at least have a completed Canada page! And what a hairdresser’s nightmare that now looks! With Canada being minnows they weren’t afforded the two page spread reserved for the bigger sides. They were reduced to a single page effort, along with the likes of South Korea, Iraq, Algeria and Morocco. Only Iraq and Canada have never qualified for the Finals again. . The players couldn’t even get a sticker each and had to share their moment in the spotlight with a team-mate. You did at least get the squad photo and the highly sought after silver foil badge in the ten sticker collection. It’s interesting to look back on the 16 players featured. When I was sticking those into my album 26 years ago, I never thought I’d be living in the mysterious country of Canada, never mind chatting regularly with many of the players featured. Bobby Lenarduzzi still has his full head of hair, but the others haven't fared so kindly! Carl Valentine isn't quite sporting an afro in the photo but it's certainly more than he has now. Current media pundits David Norman and Paul Dolan must be looking back on these photos and reminiscing about many things, and like myself, combs being one of them. Ten of the 16 players played for Vancouver Whitecaps/86ers at some point in their careers. How times have changed with the current Canadian national team, never mind the actual Canadian content with the Whitecaps first team. Will Canada ever reach another World Cup finals? Will it be Rio, or will we have a longer wait? Whenever it does happen again, I'm looking forward to adding a new set of Panini stickers to my collection.